I've been meaning to read this book for a bit (it came out in 2008 -- I'm happy to say that tagging books on my Amazon wishlist and then using it to place titles on hold via my library's online catalogue works perfectly, but a bit slowly!) Before I return it, I thought I'd share some of Baker's key points so you can be intrigued enough to check it out. Like me, you may avoid BPA in canned goods and search EWG's Skin Deep database before you buy mascara.... You may eschew nonstick for cast-iron cookware, and skip the carpet stainblock. If so, you'll be amazed by the extent of the research Baker cites about how affected industries were well aware of potential health concerns and stalled government intervention as long as possible in order to keep selling chemicals to consumers eager for (costly) convenience. 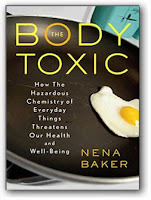 Baker's book traces the path of atrazine (a common pesticide), phthalates, flame retardants (polybrominated diphenyl ethers), bisphenol-A, Teflon (perfluorinated chemicals) through their impact on humans and the environment, and through any relevant (though mostly absent) government regulation. Baker delves into the history of the Toxic Substances and Control Act of 1976, which grandfathered in thousands of chemicals (ensured they could be used without any safety testing) and basically set the stage for industry self-regulation. She shares current research on what's called our chemical body burden -- the traces of chemicals that show up in every person on earth these days, regardless of where you live or how much organic produce you eat. Baker shares the steps she's taken to limit her exposure to hazardous chemicals in her everyday life (like not eating microwave popcorn because of the fluorotelemers in the packaging) and gives tips for our everyday lives, many of which will sound familiar (no Teflon cookware, no stain repellants on carpet, no BPA in her water bottle). I don't want to share the whole thing 'cause the book is so well worth reading. I think I might have read this, but it might have been a different book on the topic, so I just requested this and I'll read it now! Thanks for the review. Sure, JAM - it's well written and worth your time if you haven't read it. Wish lists: are you on Paperbackswap.com? I add to my wish list on PBS and then when the books become available, I grab them. It's slow sometimes, but it works for me. At least you know it's not a scam if PBS is representing it. Just requested that one too - thanks! Read this book last summer. It completely freaked me out. The most discouraging thing (other than of course, the sheer prevalence of it) is where chemicals are hidden - like your microwave popcorn!